Rock River Arms’ LAR series is getting a boost with the addition of new 5.56 NATO chambered models into the LAR-15 line. The LAR-15 semi-auto pistol variants use an A4 design paired to an SB Tactical SBX-K Brace. The SBX-K is a shorter version of the company’s original SBX Brace. The SBX-K comes with a lower profile to match the AR-15 pistol’s ergonomics. Rock River said the advantage to the brace is that it provides an additional contact point for shooters aside from just the grip and pistol fore-end. “As a BATF-compliant part for legal use on a pistol platform, the addition of the SBX-K brace on the new LAR-15 models makes these pistols a viable and reliable option for those looking for a compact at-home or on-the-go personal defense firearm,” Rock River Arms said in a news release. 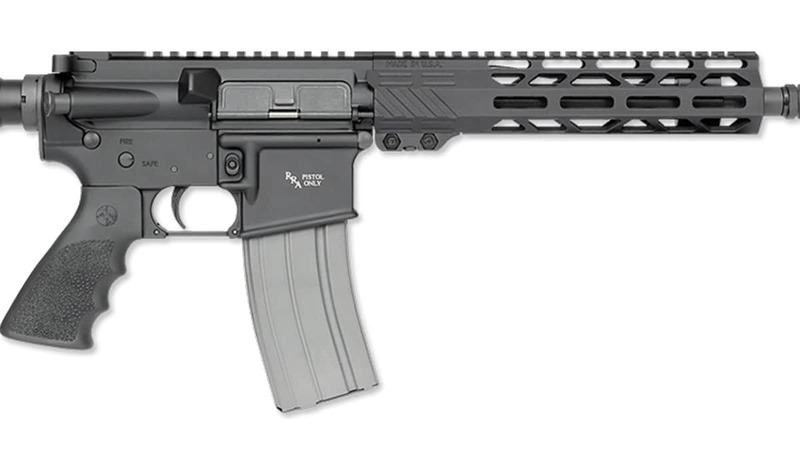 The LAR-15 in 5.56 come with the shooter’s choice of either a 7-inch chrome lined barrel and 6-inch extended length aluminum free-float RRA lightweight handguard or a 10.5-inch chrome lined barrel and 9.25-inch mid-length lightweight aluminum free-float RRA handguard. Both handguards offer M-LOK compatibility. Featuring a single-stage trigger, the LAR-15 uses a Hogue rubber grip and A2 flash hider with 1/2 x 28 thread. The LAR-15 measures 24.75-inches in total length for the 7-inch barrel model and 29.25-inches for the 10.5-inch barrel variant, with weights at 5.6-pounds and 6.3-pounds respectively. The 5.56 models are available from Rock River Arms with prices starting at $940 for the 7-inch model and $980 for the 10-inch model.